The European mink (Mustela lutreola), also known as the Russian mink, is a semiaquatic species of mustelid native to Europe. It is similar in colour to the American mink, but is slightly smaller and has a less specialised skull. Despite having a similar name, build and behaviour, the European mink is not closely related to the American mink, being much closer to the European polecat and Siberian weasel (kolonok). The European mink occurs primarily by forest streams unlikely to freeze in winter. It primarily feeds on voles, frogs, fish, crustaceans and insects. As of 2005, seven subspecies are recognised. The European mink is a typical representative of the genus Mustela, having a greatly elongated body with short limbs. 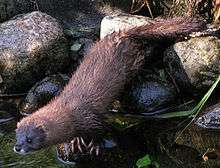 However, compared to its close relative, the Siberian weasel, the mink is more compact and less thinly built, thus approaching ferrets and European polecats in build. The European mink has a large, broad head with short ears. The limbs are short, with relatively well-developed membranes between the digits, particularly on the hind feet. The mink's tail is short, and does not exceed half the animal's body length (constituting about 40% of its length). The European mink's skull is less elongated than the kolonok's, with more widely spaced zygomatic arches and has a less massive facial region. In general characteristics, the skull is intermediate in shape between that of the Siberian weasel and the European polecat. 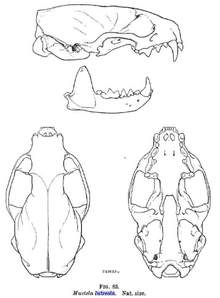 Overall, the skull is less specialised for carnivory than that of polecats and the American mink. Males measure 373–430 mm (14.7–16.9 in) in body length, while females measure 352–400 mm (13.9–15.7 in). Tail length is 153–190 mm (6.0–7.5 in) in males and 150–180 mm (5.9–7.1 in). Overall weight is 550–800 grams (1.21–1.76 lb). It is a fast and agile animal, which swims and dives skilfully. It is able to run along stream beds, and stay underwater for one to two minutes. When swimming, it paddles with both its front and back limbs simultaneously. The European mink is similar to the American mink, but with several important differences. The tail is longer in the American species, almost reaching half its body length. The winter fur of the American mink is denser, longer and more closely fitting then that of the European mink. Unlike the European mink, which has white patches on both upper and lower lips, the American mink almost never has white marks on the upper lip. The European mink's skull is much less specialised than the American species' in the direction of carnivory, bearing more infantile features, such as a weaker dentition and less strongly developed projections. The European mink is reportedly less efficient than the American species underwater. 1 2 3 Maran, T.; Skumatov, D.; Palazón, S.; Gomez, A.; Põdra, M.; Saveljev, A.; Kranz, A.; Libois, R. & Aulagnier, S. (2011). 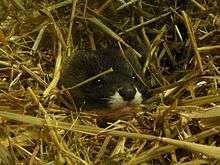 "Mustela lutreola". IUCN Red List of Threatened Species. Version 2011.2. International Union for Conservation of Nature. Retrieved 18 January 2012. 1 2 Davidson, A., Griffith, H. I., Brookes, R. C., Maran, T., MacDonald, D. W., Sidorovich, V. E., Kitchener, A. C., Irizar, I., Villate, I., Gonzales-Esteban, J., Cena, A., Moya, I. and Palazon Minano, S. 2000. Mitochondrial DNA and paleontological evidence for the origin of endangered European mink, Mustela lutreola. Animal Conservation 3: 345–357. 1 2 3 4 5 6 7 8 9 Maran, T. and Henttonen, H. 1995. Why is the European mink, Mustela lutreola disappearing? - A review of the process and hypotheses. Annales Fennici Zoologici 32: 47-54. ↑ Wozencraft, W.C. (2005). "Order Carnivora". In Wilson, D.E. ; Reeder, D.M. Mammal Species of the World: A Taxonomic and Geographic Reference (3rd ed.). Johns Hopkins University Press. ISBN 978-0-8018-8221-0. OCLC 62265494. ↑ Engländer, Wiltraud (2010). Taylor, Neil, ed. Estonia (6th ed.). ↑ Maran, Tiit; Põdra, Madis (August 2009). "The survival of captive-born animals in restoration programmes – Case study of the endangered European mink Mustela lutreola". Biological Conservation. Elsevier Ltd. 142 (8): 1685–1692. doi:10.1016/j.biocon.2009.03.003. ISSN 0006-3207. ↑ Tere, Juhan (16 August 2012). "European mink planned to be re-introduced to Saaremaa". The Baltic Course. Retrieved 14 February 2013. 1 2 3 "Khonorik: Hybrids between Mustelidae". Russian Ferret Society. Retrieved 9 May 2011.